The carbon trade doesn’t just fail to address climate change. In countries like Honduras, it funnels cash to notorious human rights abusers and threatens vital resources. Carbon trading was developed as a mechanism for addressing global climate change under the Kyoto Protocol. It allows companies rooted in the global North, which collectively produce most of the world’s greenhouse gases, to buy and sell “Certificates of Emissions Reduction” from developing-world companies rather than cut their own emissions. The practice enables them to continue polluting based on the assertion that emissions elsewhere are being cut. Through this mechanism, they pay companies in the global South that have implemented “green” initiatives (making new technological investments or reducing deforestation, for example) and either use the certificate to avoid cutting their own emissions or else sell it to another company. This scheme is not only accepted, but also actively promoted, by both the United Nations and the World Bank. But carbon trading does not actually fulfill its stated goal of cutting global emissions, since the price of carbon remains too cheap to curb polluter behavior. The study “Carbon Trading—How It Works and Why It Fails” shows that carbon trading allows overall air pollution and climate change to continue to escalate. But the carbon trade doesn’t just fail to address climate change. In countries like Honduras, it fuels a perverse incentive structure by funneling cash to notorious human rights abusers engaged in extractive industries. “Carbon trading” is the term governments, institutions, and companies in the North use to describe the swaps of credits for pollution. But, perhaps reflecting on the carbon trade’s commodification of vital resources, Vitalino Álvarez insists that it’s the oxygen generated by palm trees that’s being traded. And, he says, the money made by the palm giants selling oxygen is being used to finance hit men (sicarios). In Bajo Aguán, carbon trading and the related changes in land ownership laws have resulted in the expansion of palm oil plantations, which now use a new methane-capture system that purportedly reduces the plantations’ footprint (even as the entire business is premised on deforestation). This expansion has displaced many farmers as aggressive plantation owners have maneuvered to get a piece of the lucrative carbon credit business. Over the years, the farmers’ negotiations with politicians have failed, and court battles have dragged on. Ultimately this has resulted in bloody land conflicts. And die they do. 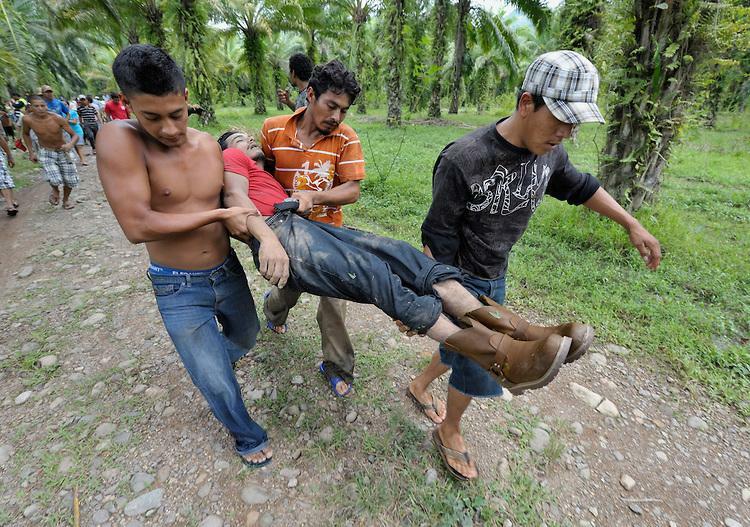 Since 2009, in Bajo Aguán alone, almost 100 farmers and their advocates have been assassinated. Farmers accuse security agents employed by owners of large palm plantations of ordering these murders and allege state complicity. Security guards for the palm oil company Dinant, for example, have attacked farmers during violent evictions, with large contingents of soldiers and police clearly on their side. Cases of assassinations against farmers have so far gone unpunished. One day in November 2012, Álvarez was heading home with another farmer when unknown assailants opened fire on them with heavy weapons. Álvarez and his companion managed to escape, but the MUCA activist has since received numerous death threats and was arrested twice that August. On one of those occasions, he was arrested together with more than 20 other farmers, including a human rights defender for the agrarian community, Antonio Trejo. Trejo was later murdered after receiving a series of death threats. Living amid this siege, Álvarez often tells the press that if anything happens to him, Dinant is responsible. Not only has Dinant gone unpunished for murder, it also slated to receive a whopping $30 million in loans from the World Bank International Finance Corporation. The first half was dished out about four months after the coup started, with the other half due to Dinant this year. This money finances the company’s crimes. Even more strikingly, Dinant continues to be approved to sell carbon credits under the UN Clean Development Mechanism (CDM), which permits the Northern companies who buy them to pollute more than they otherwise could. Honduras’ many rivers also make it a target for hydroelectric dams, which have generated carbon credits since 2005. The Honduran legislature approved 47 dams in 2010 alone. Honduran Congress Secretary Gladis Aurora Lopez, who aided in their approval, was a major shareholder of one of these concessions, the Aurora Company. At least 19 dams are registered with CDM concessions. Hydroelectricity dam concessions to companies sound green. But as indigenous activists in Honduras have pointed out, dams privatize communal water sources, thereby increasing living costs and militarizing communities as security forces mobilize to protect the privatized resources. Moreover, they also cause flooding and droughts, and destroy wildlife. Concerns have been raised that earthquakes in San Juan Altántida may have been caused by dam construction by the company Contempo of Grupo Terra. The companies who own the dams become owners of the “oxygen,” which they then sell as offset credits even as they also provide water to mining companies, who pollute it with deadly contaminants. One dam in Lepaterique (La Esperanza), run by Canadian-led consortium called Consorcion de Inversiones (CISA), has sold oxygen since 2005. The Lepaterique community agreed to this pilot CDM project damming a local river when it was promised social and developmental projects. To date, there has been no communication between CISA and the community, and according to Lepaterique community board president and retired teacher Benjamin Diaz, the majority of the company’s promises remain unfulfilled. Diaz notes that one of the few promises that has been fulfilled is the building of a highway. However, as with the dam, CISA security guards ensure that access to the highway is restricted to the dam’s owners and employees. Other unrealized promises include improvements to the school, streets, and highways, as well as housing construction. Other benefits have advanced, but in smaller quantities than promised. These include job creation (fewer than 20 jobs were created out of 80 promised), medical brigades, reforestation (a small eucalyptus plantation was planted to mitigate damages caused by the dam), and a tiny amount of tax paid to the community council. Negative impacts, on the other hand, have been significant. They have included flooding from the dam, damaging the vegetation and the bridge, and a foul smell from the dam’s oxidation lake. The one consolation in all this is that the Lepateriquens’ lives do not depend on the river, which is used mostly for sewage and wastewater. Elsewhere, in Atlántida, northern Honduras, local leaders of the environmental and social justice group Movimiento Amplio por la Dignidad y Justicia (MADJ), told me in March 2013 about newer CDM dams in and around their community. The leaders, Rigoberto Espinoza and Osmán Orellana, said that the builders of the dams did not bother to carry out environmental impact studies or consult local communities. When local residents protest the subsequent soil erosion from the drying of local rivers, thuggish security guards disperse them. The companies involved claim to have consulted local communities, but MADJ leaders say this mostly consisted of bribing local officials and persuading residents to sign documents under false pretenses. The projects, moreover, create few desirable local jobs, even though many Hondurans are badly in need of work. Where jobs do become available, worker safety is a particular concern. At the Masca dam, Osmán said, two workers, including his brother-in-law, were killed by faulty construction vehicles. Many others have been grievously injured. “The workers are practically slaves,” he said, “but slaves because of their needs.” Osmán indicated that more technical jobs are done by people from outside, leaving community members to do dangerous work like exploding dynamite, making tunnels, taking rocks out of the river, and other heavy labor. Many communities are doing what they can to oppose and prevent the double sale of oxygen and water as the rivers become dammed. Like the farmers in Bajo Aguán, they similarly risk their lives. Osman spoke about how in a public meeting, his cousin Roberto spoke up against so-called forest cooperatives that the mayor was promoting. Roberto accurately observed that the initiative was simply being used to force hydroelectricity projects on local communities. When Roberto tried to interview the mayor, the mayor grabbed the neck of his shirt, and said, “You people are yangaras (communists) who are here to make life impossible.” When Roberto filed a complaint about this, the mayor gave a gift to the judge and subsequently won the case. Roberto then received a chain of threats, and in 2012 was forced to leave the country. Miguel Facussé, the palm giant accused of mass killings through Dinant in Aguán, is also implicated in Atlántida. Another three CDM dams, are owned by Fredy Nasser’s Grupo Terra. Fredy is a son-in-law of Miguel Facussé. Nasser in fact owns 20 of the 24 dam concessions in Atlántida. Miguel Facussé’s other son-in-law, Lenir Perez, owns the largest mine project in Atlántida. Facussé has already landgrabbed most of Aguán (the most fertile part of Honduras) and Zacate Grande, and now his family is expanding its control over Atlántida. Atlántida is a few hours by bus from Bajo Aguán. But lives seen as obstacles to oxygen trading are vulnerable in both places, reminding us of the urgency and relevance of this problem around Honduras and the world. Oxygen trading does not stop at rivers and palm trees. Honduras has forested land too. The World Bank’s Forest Carbon Partnership Facility (FCPF) promotes and facilitates a program called “Reducing Emissions from Deforestation and Degradation,” also known as REDD-plus. Like the other programs, this involves selling oxygen based in the South. Officially, REDD-plus has not yet been implemented in Honduras. But a $3.4-million grant for REDD Readiness Preparation was approved for Honduras and five other countries at a March 2013 meeting in Washington, DC. Prior to this, an agreement to participate in the preparation toward REDD-plus was signed in January 2013 with the Confederation of Autonomous Peoples of Honduras (CONPAH) after a year of negotiations over indigenous rights. The Indigenous and Grassroots Organizations Council of Honduras (COPINH) wrote a public letter to FCPF in February 2013 to clarify that neither it nor the Afro-descendent Fraternal Black Organization of Honduras (OFRANEH) is part of CONPAH, and neither group will participate in the process to prepare REDD-plus. Indeed, they have been strongly critical of it and reject it outright. Berta Cáceres of COPINH lives in the frosty, rural, and indigenous Lenca territory of La Esperanza. In a public letter, she explained that her organization is not against indigenous people being compensated for caring for forests; this is something they have done for centuries. She pointed out instead that genuine efforts to stop deforestation would require stopping large timber companies from clearing the land, not commodifying the forests to provide credits for big polluters around the world to continue contaminating. In a January 2012 interview, Berta warned me about how REDD-plus will impact communities where it’s implemented. “It means that they are going to put army or security guards to make sure nobody enters,” she said, “so families can’t go and collect firewood or medicine.” The land will be privatized and conceded to companies, and the community will be excluded from making any decisions about it. This process opens doors to concessions of commercial projects, CDMs, mining, dams, and other projects damaging to forests. In light of this situation, perhaps REDD-plus would be better described as a business of “Reinforcing Enforcement of Dispossession” against communities—and one that causes deforestation anyway. Death threats are just as real to those defending communities against REDD-plus as they are to those defending farms and rivers. Cáceres closed the 2012 year reporting serious and escalating death threats against herself and her family. In May 2013, while at a highway blockade organized against the damming of Rio Blanco, Berta was captured by police and detained overnight. She is still battling the charges against her. It is no coincidence that Honduras is a hotbed for oxygen traders. Not only are there vast natural resources, but the state of impunity that the 2009 military coup intensified makes the country all the more attractive for profit making ventures. Still, Honduras is just one example of a global phenomenon. As UN negotiations have not solved the problem, the necessity for grassroots collaboration to create real change is all the more urgent. There is right now an opportunity for activists worldwide to join forces, share experiences, analyze the way markets dominate our lives, and decide collectively as communities from around the world what real climate solutions would mean and how to create a different system. The stories of Vitalino, Berta, and the rest—and the memories of the nearly 100 farmers killed in Bajo Aguán—remind us of the urgency and importance of activism to stop the oxygen trade and start finding real solutions. Rosie Wong has accompanied the anti-coup movement in Honduras since 2009, visiting Honduras several times and doing organizing work in Sydney, Australia.